Almost two decades of digital home video have spoiled us. We expect a gleaming, pristine presentation every time. I try to resist this, particularly with older films, simply because the technical possibilities and limitations of film stocks, cameras, and the ravages of time all leave their mark on movies. Allowances need to be made, and in the right frame of mind a restored film from the ’20s can be a breathtaking visual experience even though it lacks the supposed “flawlessness” of HD video. And yet, there are still times when I feel at least a little bit disappointed. 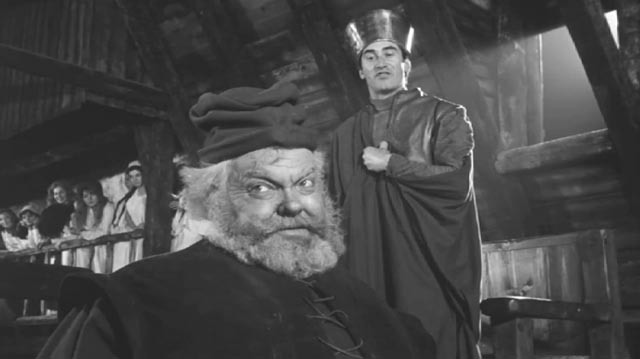 When I saw that Mr Bongo in England were planning a 50th Anniversary Restored Edition on Blu-ray of Orson Welles’ greatest film, Chimes At Midnight (1965, aka Falstaff), perhaps the greatest of all Shakespeare films, I was filled with excited anticipation. Finally, I would get to see this masterpiece in all its black-and-white glory after having to make do with a merely adequate Spanish PAL DVD. But my heart quickly sank when I put the disk in and began to watch this favourite. There was little indication of any major restoration; the print looked as worn as that used for the DVD; contrast was often weak, with blacks appearing more grey than black; and the sound had a muffled quality which made the poetic dialogue at times difficult to decipher. To add to my disappointment with the disk, there are absolutely no supplements to illuminate the convoluted history of the film – not even liner notes. Still, at least Chimes at Midnight is finally accessible in a region-free format at a reasonably affordable price. Strangely, a lesser – and far more obscure – title fares better in another Blu-ray edition from Mr Bongo. 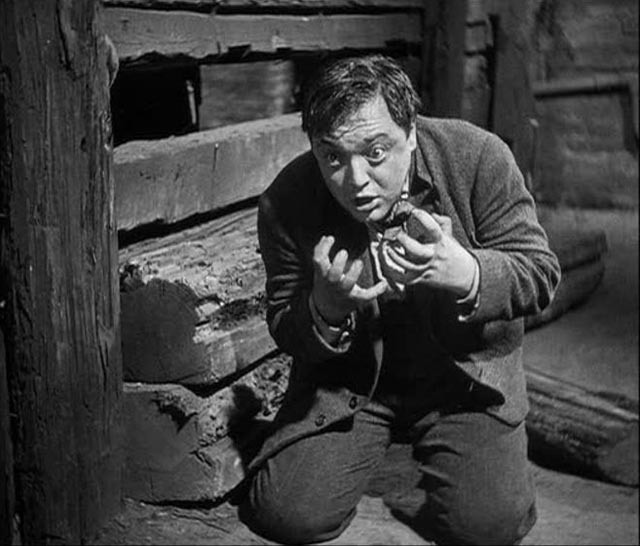 Too Much Johnson (1938) could be said to be Welles’ first professional film, after the amateur short The Hearts of Age (1934), although it isn’t a fully-fledged movie at all. It was conceived as filmed inserts to be used in a stage revival of William Gillette’s 1894 adaptation of a French farce. The idea of combining live action with filmed interludes proved unworkable and Welles set the material aside and eventually believed it lost in a fire in 1971. However, the footage was rediscovered in an Italian warehouse in 2008 and restored by the George Eastman House. For such an ephemeral work, the quality of the image is spectacular; it looks pristine, with rich blacks and a full range of greys. The 67-minute assembly presented on the Blu-ray is a fascinating glimpse of the young Welles playing with a new medium, yet harking back to that medium’s childhood. Essentially a collection of slapstick gags reminiscent of Mack Sennett and the Keystone Kops, the material sketches three separate episodes – in the first, Augustus Billings (Joseph Cotten) is caught by a cuckolded husband having a tryst in the couple’s bedroom; Billings flees through a window and onto a fire escape. The second section is an extended chase through various streets, warehouses, and over rooftops. Finally, the least developed section has Billings fleeing to Cuba, where he assumes the identity of plantation owner Johnson. However, little of the narrative is apparent in the material itself. To a large degree, this is essentially a collection of rushes, with multiple takes of gags presented one after another. The gags themselves are often terrific – and Cotten performs some obviously very dangerous stunts with the careless aplomb of the great silent comedians. Individual details are impressive, but watching the whole thing through is a bit exhausting, particularly in the final section where any sense of narrative breaks down completely. 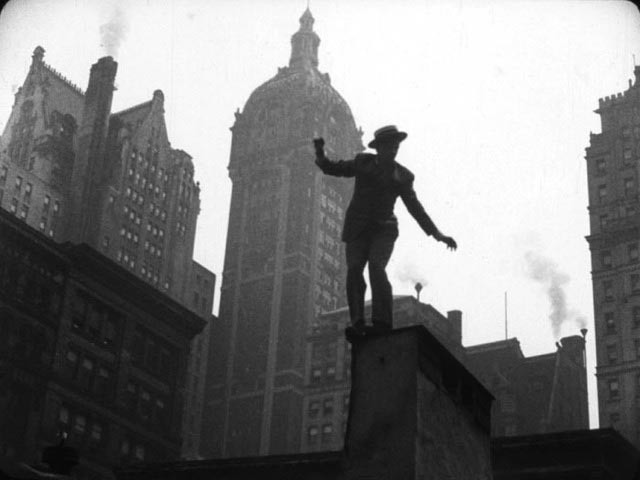 And yet, in the first section, the illicit romantic tryst – which obviously had the most work done on it before the whole thing was set aside – Welles displays a radical sense of editing; there are moments here which are reminiscent of Soviet montage, but even more striking are suggestions of a surrealistic sensibility akin to the early Bunuel, with a playfully absurd use of incongruous juxtapositions and non-linear cutting. Here, at just 23, Welles was already exhibiting the love of the medium which drove him for many subsequent decades to keep making films despite all the obstacles put in his way by his refusal to play the studio game. A similar kind of playfulness arising from an affection for some of the lower forms of commercial cinema marks a pair of movies made in the mid-’60s by the French director Philippe de Broca. That Man From Rio (1964) and Up to His Ears (1965), released in a two-disk Blu-ray edition by the Cohen Collection, are fluff, a boisterous send up of glossy international thrillers epitomized by the Bond movies. 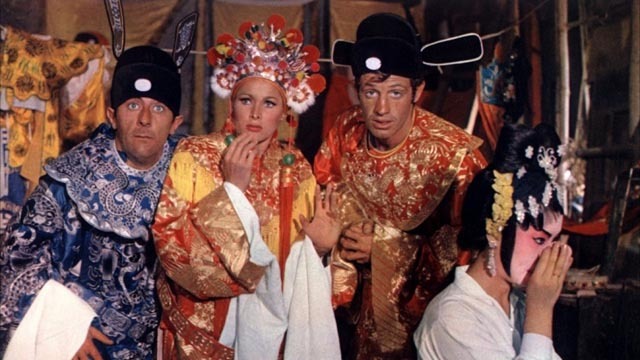 Both are episodic, nonsensical narratives starring Jean-Paul Belmondo at his most insouciantly comic – and doing his own, again quite spectacular, stunts. Both films were hits, and the first is generally considered to be the most creatively successful. I have to confess though that I prefer the second. I found That Man From Rio a bit forced and mechanical in its effects. Belmondo is a soldier on leave whose girlfriend is kidnapped by shadowy villains who are determined to recover three South American statuettes which hold the key to a vast fortune. He follows her to Brazil, gets into a lot of complicated situations, and manages to clear up the mess in time to get back to base on schedule. The film is colourful, making exotic use of its locations, and – as various people point out in the documentary accompanying the film on the Blu-ray – it manages to evoke Herge’s stories of Tintin more faithfully than official adaptations. Up to His Ears has a looser, more improvisatory feel, with Belmondo this time playing Arthur, a wealthy but bored socialite who keeps trying to commit suicide but failing. At the urging of his mentor Mr. Goh (Valéry Inkijinoff), Arthur takes out a big insurance policy with his fiancee as beneficiary; then Mr. Goh hires some men to kill him. While running from these assassins, Arthur meets and falls for Alexandrine (Ursula Andress). His adventures, starting in Hong Kong, take a number of diversions, including a balloon trip over the Himalayas, before he finally gets over his boredom. Even the people who made the film consider that it was a failure – too much, too busy – and yet I found it more entertaining than the previous film. However, Belmondo is a charming adventurer in both, and both offer a great deal of colourful eye candy. The Cohen two-disk edition offers fine transfers of both films, along with impressive supplements, including fairly lengthy documentaries on each feature by Jerome Wybon. Back in the early days of Canada’s tax shelter era, there were a number of movies which didn’t strain to disguise their Canadian identity. These films were set in recognizably Canadian locations. Like Cronenberg’s Shivers and Rabid, Harvey Hart’s The Pyx (1973) was quite open about taking place in Montreal. In fact, it was even more distinctively set there than Cronenberg’s movies, with characters switching easily between English and French – unsubtitled on the DVD from Scorpion Releasing, adding an interesting touch of otherness which further sets the film apart from all the fake American movies to come. Which is not to say that The Pyx is entirely successful. In fact, it could be argued that it’s a little too “Canadian” for its own good, low key and polite to the point where its climactic Satanic ceremony seems as threatening as a society ladies’ tea party. But despite the overall lack of tension in its parallel narrative strands dealing with events leading up to the death of a prostitute and the police investigation which follows, it has a distinctive atmosphere of seedy urban dread and some decent performances, including one of Karen Black’s finest as Elizabeth Lucy, the self-assured call girl who is manipulated into serving as a blood sacrifice for a shadowy clique of Satanists. Christopher Plummer and Daniel Pilon deliver good turns as the pair of detectives investigating her death. Hart had a long career mostly in television. The Pyx may be his most interesting movie, even if it doesn’t entirely work. At least it wasn’t a pale imitation of bigger budget movies from down South. Plus, on the soundtrack, Karen Black gets to sing several surprisingly lovely songs which she wrote herself. Black provides a commentary track, an unexpectedly interesting one in fact for a disk which is part of the Katarina’s Nightmare Theater series, “presented” by professional wrestler Katarina Leigh Waters. 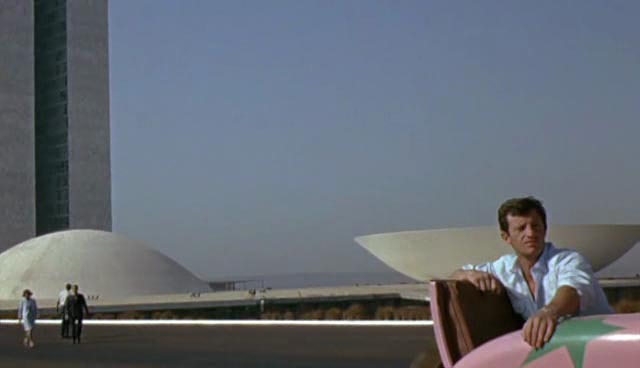 The track is a conversation between Black and “movie geek” Marc Edward Heuck; the actress offers memories of Hart and co-star Plummer, but mostly concentrates on technical aspects of acting, while occasionally being doubtful or puzzled by Heuck’s minutely detailed critical opinions – he offers a lengthy exegesis of all the religious symbols running through the film (visual and verbal) and manages to make it sound a lot more profound than it appears on the surface. By the end, even Black seems impressed and half-willing to believe The Pyx is much more than she thought when she was working on it. Despite the presence of a major Hollywood star, Robert Mitchum, Arthur Ripley’s Thunder Road (1958) has the look and sensibility of a low-budget slice of regional exploitation. Based on a story by Mitchum, this black-and-white drive-in favourite deals with back-country moonshiners in the rural South and the government revenuers trying to shut down their illicit business. Mitchum is Lucas Doolin, a man who came back from the war with apparently no sense of danger; he drives modified “tanker” cars fitted with 250-gallon tanks for the liquor and souped up engines for running back-roads at high speeds. But despite his lack of concern for his own safety, he’s dead set against his younger brother, Robin (Mitchum’s own son James, in a slightly disorienting piece if casting), entering the business. The film’s theme is that classic American idea that every individual stands alone and has the right to do whatever he wants without government interference. But of course, this being America, it’s not just the government threatening the moonshiners’ independence; the criminal corporation run by shady businessman Carl Kogan (Jacques Aubuchon) is out to take over all the business in the valley. Ripley stages the action well, with some dynamic road chases, crashes, and occasional gunfire. Despite Lucas having no less than two women urging him to quit and settle down, his fate is pretty much a foregone conclusion. 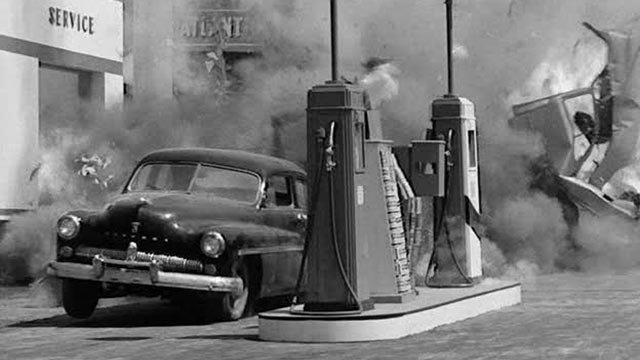 Thunder Road is good old-fashioned, unassuming entertainment with Mitchum at his casual best as the anti-hero. Timeless Media/Shout! Factory have provided a decent transfer, with all the night shooting effectively supported by strong contrast and solid black levels. The Pyramid (Gregory Levasseur, 2014): This by-the-numbers horror, somewhat reminiscent of As Above, So Below, has an archaeological team heading into a recently discovered buried pyramid in Egypt. A false sense of tension is attempted by setting it during recent civil unrest in the country, but it’s basically just a monster movie with a bunch of disposable characters available for killing. Although it sets itself up as a “found footage” movie, it randomly switches between the cameras carried by the team and a third person camera, as if Levasseur simply couldn’t be bothered with the effort of making the conceit work. Unlike As Above, So Below, at least it shows its monster (at times too clearly); but strangely the wolf-headed Anubis is depicted as a mindless beast rather than as the god who sends souls into the afterlife. 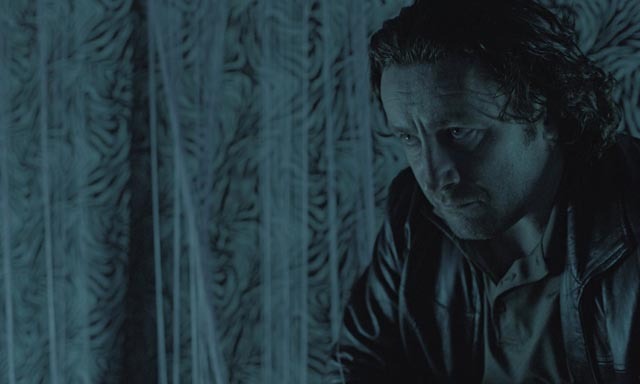 Hyena (Gerard Johnson, 2014): This was a big disappointment, coming from the director of the chilling Tony (2009) and starring that film’s Peter Ferdinando. Tony was an original and disturbing variation on the serial killer, with its protagonist a pathetic, socially inept misfit who finds in murder a way to ease his sense of urban alienation. Hyena, on the other hand, is a fairly cliched tale about “good cops” who happen to be completely bent even as they do an effective job dealing with criminal scum involved in drugs and prostitution. It’s as if Regan and Carter in the great ’70s TV series The Sweeney weren’t just tough, but were also on the take. Four decades on, being tough means also being corrupt, yet still good at the job. There are some decent sequences, but the characters are all unlikable and, rather mystifyingly, the movie just stops dead before it reaches a climax, apparently in an unsuccessful attempt to seem profound. Wild Card (Simon West, 2015): I like Jason Statham. He’s a terrific action star, has an engaging persona and a sense of humour. Too bad he often lends his talent (and he does have acting talent) to a lot of otherwise worthless movies, this being a case in point. There was once a time when William Goldman was a capable scriptwriter, but here, adapting his own novel Heat, he can’t even muster the energy to construct a plot. 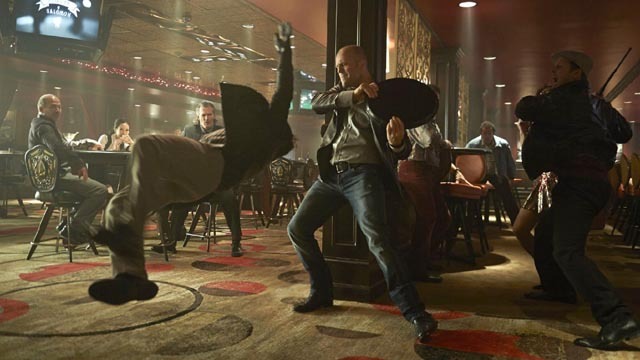 Statham is a Las Vegas bodyguard for hire (Nick Wild) with a gambling problem; a female friend is brutalized and beaten by some arrogant hoods; Nick helps her get revenge, only to discover that the lead hood is very well-connected. So now Nick has to find a way to placate a big mob boss (Stanley Tucci, phoning it in). Occasionally things erupt into big choreographed fight scenes (courtesy of Corey Yuen), which lay waste to any pretense that this is taking place in the real world. 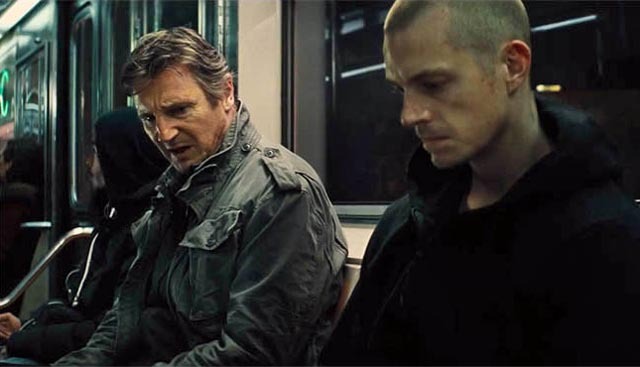 Run All Night (Jaume Collet-Serra, 2015): Liam Neeson, everyone’s favourite 60+ action hero, re-teams with his Unknown/Non-Stop director for a story about Jimmy Conlon, a washed-up, alcoholic gang enforcer in New York. When the son who has disowned him in disgust is targeted by his old boss (Ed Harris), Jimmy has to choose between family and the mob; needless to say, he takes on the mob while trying to help his son survive (and doing some bonding along the way). This is more Walk Among the Tombstones than Taken, which means that it takes itself very seriously and lacks the comic book pleasures of the latter series. Young Ones (Jake Paltrow, 2014): Gwyneth Paltrow’s younger brother manages to create a visually convincing future world of drought and desolation on a low budget, but he can’t breathe much dramatic life into this family drama about a man (Michael Shannon, as good as ever) trying to survive in the desert with his two children (Kodi Smit-McPhee and Elle Fanning). Paltrow takes a setting which harks back to A Boy and His Dog and Mad Max and goes for Greek tragedy instead of post-apocalyptic thrills. It works sporadically, but in the end feels as enervated as the parched landscape it’s set in. 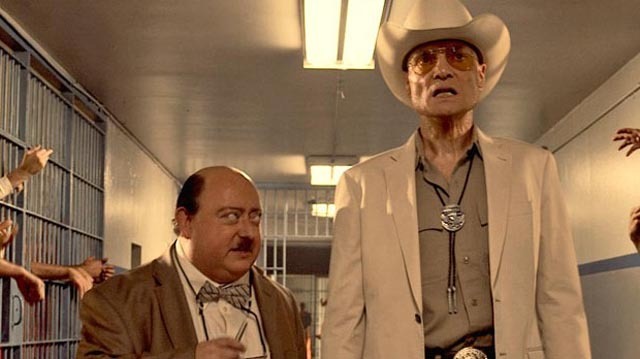 The Human Centipede 3: Final Sequence (Tom Six, 2015): I know, what did I expect? Well, not this. The first movie had a repulsive idea which was only partially realized. The second was genuinely disturbing, a creepy meta-horror which gained queasy stature from the presence of the remarkable British actor and performance artist Laurence R. Harvey as a pathetic security guard who pursues his obsession with the first film to a grotesque but inevitable conclusion. This third outing, however, is played for comedy, totally undermining the nasty core idea, and utterly sunk by a hair-raisingly miscalculated performance from Dieter Laser, star of the original movie. He manages to make the film all but unwatchable (a feat of some kind, I guess; he’s more off-putting than the concept). Harvey, returning, like Laser, in a different role, is the best thing here, but he’s not enough to stave off complete disaster. Peter Lorre: Das Doppelte Gesicht (Two Faces of Peter Lorre: Harun Farocki/Felix Hofmann, 1984): This one-hour documentary by the prolific Farocki, included as an extra on Arrow Video’s Blu-ray of Roger Corman’s The Raven, is an interesting biography of the great, idiosyncratic actor. It concentrates mostly on his earlier career, particularly his theatre work with Brecht, illuminating the ways in which an artist can be diverted by circumstance and money – lured to Hollywood, Lorre was never again the “serious actor” he was in the early days back in Germany. Watching this, I got to thinking that it might be interesting to do a remake of Lorre’s breakthrough picture, Fritz Lang’s M, with Laurence R. Harvey in the role of the child murderer. That I would definitely pay to see! This entry was posted in Commentary, Review and tagged Action, Actors, Blu-Ray, Comedy, Crime, Directors, Documentary, DVD, Horror, Science Fiction, Thrillers. Bookmark the permalink.